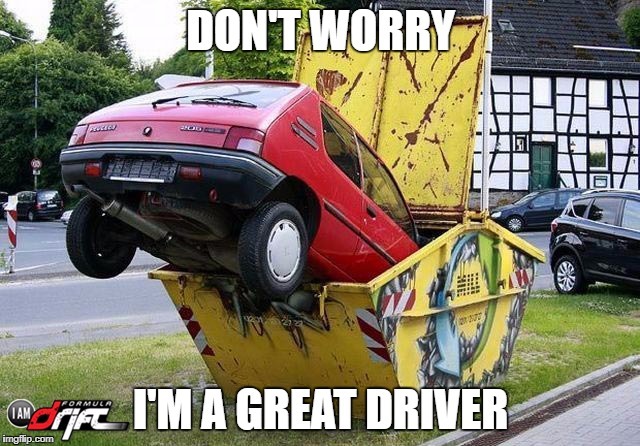 In a classic study, Ola Svenson (1981) found that about 80% of U.S. and Swedish college students rated themselves as being both safer and more skilled as drivers than other students in the room answering the same questionnaire. (See also Warner and Aberg 2014.) Similarly, most respondents tend to report being less susceptible to cognitive biases and sexist bias than their peers, as well as more honest and trustworthy -- and so on for a wide variety of positive traits: the "Better-Than-Average Effect". Particularly interesting are explanations of the Better-Than-Average Effect that appeal to people's idiosyncratic standards. What constitutes skillful driving? Person A might think that the best standard of driving skill is getting there quickly and assertively, while still being safe, while Person B might think skillful driving is more a matter of being calm, predictable, and within the law. Each person might then prefer the standard that best reflects their own manner of driving, and in that way justify viewing themselves as above average (e.g., Dunning et al. 1991; Chambers and Windschitl 2004). In some cases, this seems likely to be just typical self-enhancement bias: Because you want to think well of yourself, in cases where the standards are ambiguous, you choose the standards that make you look good. Changing example, if you want to think of yourself as intelligent and you're good at math, you might choose to think of mathematical skill as central to intelligence, while if you're good at practical know-how in managing people, you might choose to think of intelligence more in terms of social skills. But in other cases of the Better-Than-Average Effect, the causal story might be much more innocent. There may be no self-flattery or self-enhancement at all, except for the good kind of self-enhancement! Consider the matter abstractly first. Kevin, Nicholas, and Ana [note 2] all value Trait A. However, as people will, they have different sets of evidence about what is most important to Trait A. Based on this differing evidence, Kevin thinks that Trait A is 70% Property 1, 15% Property 2, and 15% Property 3. Nicholas thinks Trait A is 15% Property 1, 70% Property 2, and 15% Property 3. Ana thinks that Trait A is 15% Property 1, 15% Property 2, and 70% Property 3. In light of these rational conclusions from differing evidence, Kevin, Nicholas, and Ana engage in different self-improvement programs, focused on maximizing, in themselves, Properties 1, 2, and 3 respectively. In this, they succeed. At the end of their training, Kevin has the most Property 1, Nicholas the most Property 2, and Ana the most Property 3. No important new evidence arrives in the meantime that requires them to change their views about what constitutes Trait A. Now when they are asked which of them has the most of Trait A, all three reasonably conclude that they themselves have the most of Trait A -- all perfectly rationally and with no "self-enhancement" required! All of them can reasonably believe that they are better than average. Real-life cases won't perfectly match that abstract example, of course, but many skills and traits might show some of that structure. Consider skill as a historian of philosophy. Some people, as a result of their training and experience, might reasonably come to view deep knowledge of the original language of the text as most important, while others might view deep knowledge the the historical context as most important, while others might view deep knowledge of the secondary literature as most important. Of course all three are important and interrelated, but historians reasonably disagree substantially in their comparative weighting of these types of knowledge -- and, I think, not always for self-serving or biased reasons. It's a difficult matter of judgment. Someone committed to the first view might then invest a lot of energy in mastering the details of the language, someone committed to the second view might invest a lot of energy in learning the broader historical context, and someone committed to the third view might invest a lot of energy in mastering a vast secondary literature. Along the way, they might not encounter evidence that requires them to change their visions of what makes for a good historian. Indeed, they might quite reasonably continue to be struck by the interpretative power they are gaining by close examination of language, historical context, or the secondary literature, respectively. Eventually, each of the three might very reasonably regard themselves as a much better historian of philosophy than the other two, without any irrationality, self-flattery, or self-enhancing bias. I think this might be especially true in ethics. A conservative Christian, for example, might have a very different ethical vision than a liberal atheist. Each might then shape their behavior according to this vision. If both have reasonable ethical starting points, then at the end of the process, each person might reasonably regard themselves as morally better than the other, with no irrational self-enhancing bias. And of course, this generalizes across groups. The Journal of Science Fiction and Philosophy, a peer-reviewed, open access publication, is dedicated to the analysis of philosophical themes present in science fiction stories in all formats, with a view to their use in the discussion, teaching, and narrative modeling of philosophical ideas. It aims at highlighting the role of science fiction as a medium for philosophical reflection. The Journal is currently accepting papers and paper proposals. 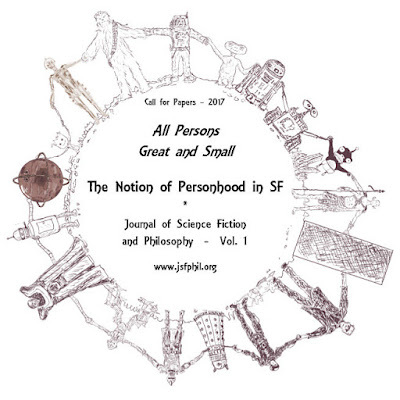 Because this is the Journal’s first issue, papers specifically reflecting on the relationship between philosophy and science fiction are especially encouraged, but all areas of philosophy are welcome. Any format of SF story (short story, novel, movie, TV series, interactive) may be addressed. We welcome papers written with teaching in mind! Have used an SF story to teach a particular item in your curricula (e.g., using the movie Gattacca to introduce the ethics of genetic technologies, or The Island of Dr. Moreau to discuss personhood)? Turn that class into a paper! Every year the Journal selects a Yearly Theme. Papers addressing the Yearly Theme are collected in a special section of the Journal. The Yearly Theme for 2017 is All Persons Great and Small: The Notion of Personhood in Science Fiction Stories. SF stories are in a unique position to help us examine the concept of personhood, by making the human world engage with a bewildering variety of beings with person-like qualities – aliens of bizarre shapes and customs, artificial constructs conflicted about their artificiality, planetary-wide intelligences, collective minds, and the list goes on. Every one of these instances provides the opportunity to reflect on specific aspects of the notion of personhood, such as, for example: What is a person? What are its defining qualities? What is the connection between personhood and morality, identity, rationality, basic (“human?”) rights? What patterns do SF authors identify when describing the oppression of one group of persons by another, and how do they reflect past and present human history? The Journal accepts papers year-round. The deadline for the first round of reviews, both for its general and yearly theme, is October 1st, 2017. Contact the Editor at editor.jsfphil@gmail.com with any questions, or visit www.jsfphil.org for more information. To some people, this sounds uncomfortably close to logical behaviorism, a view according to which all mental states can be analyzed in terms of behavioral dispositions. On such a view, to be in pain, for example, just is, logically or metaphysically, to be disposed to wince, groan, avoid the stimulus, and say things like "I'm in pain". There's nothing more to pain than that. Part of the semi-mythical history of philosophy of mind is that in the bad old days of the 1940s and 1950s, some philosophers were logical behaviorists of this sort; and that logical behaviorism was abandoned due to several fatal objections that were advanced in the 1950s and 1960s, including one objection by Hilary Putnam that turned on the idea of super-spartans. Some people have suggested that 21st-century dispositionalism about belief is subject to the same concerns. Imagine a community of 'super-spartans' or 'super-stoics' -- a community in which the adults have the ability to successfully suppress all involuntary pain behavior. They may, on occasion, admit that they feel pain, but always in pleasant well-modulated voices -- even if they are undergoing the agonies of the damned. The do not wince, scream, flinch, sob, grit their teeth, clench their fists, exhibit beads of sweat, or otherwise act like people in pain or people suppressing their unconditioned responses associated with pain. However, they do feel pain, and they dislike it (just as we do) ("Brains and Behavior", 1965, p. 9). [L]et us undertake the task of trying to imagine a world in which there are not even pain reports. I will call this world the 'X-world'. In the X-world we have to deal with 'super-super-spartans'. These have been super-spartans for so long, that they have begun to suppress even talk of pain. Of course, each individual X-worlder may have his private way of thinking about pain.... He may think to himself: 'This pain is intolerable. If it goes on one minute longer I shall scream. Oh No! I mustn't do that! That would disgrace my whole family...' But X-worlders do not even admit to having pains" (p. 11). Putnam's basic idea is pretty simple: If you're a good enough actor, you can behave as though you lack mental state X even if you have mental state X, and therefore any analysis of mental state X that posits a necessary connection between mentality and behavior is doomed. Now I don't think this objection should have particularly worried any logical behaviorists (if any existed), much less actual philosophers sometimes falsely called behaviorists such as Ryle, and still less 21st-century dispositionalists like me. Its influence, I suspect, has more to do with how it conveniently disposes of what was, even in 1965, only a straw man. We can see the flaw in the argument by considering parallel cases of other types of properties for which a dispositional analysis is highly plausible, and noting how it seems to apply equally well to them. Consider solubility in water. To say of an object that it is soluble in water is to say that it is apt to dissolve when immersed in water. Being water-soluble is a dispositional property, if anything is. Imagine now a planet in which there is only one small patch of water. The inhabitants of that planet -- call it PureWater -- guard that patch jealously with the aim of keeping it pure. Toward this end, they have invented technologies so that normally soluable objects like sugar cubes will not dissolve when immersed in the water. Some of these technologies are moderately low-tech membranes which automatically enclose objects as soon as they are immersed; others are higher-tech nano-processes, implemented by beams of radiation, that ensure that stray molecules departing from a soluble object are immediately knocked back to their original location. If Putnam's super-spartans objection is correct, then by parity of reasoning the hypothetical possibility of the planet PureWater would show that no dispositional analysis of solubility could be correct, even here on Earth. But that's the wrong conclusion. The problem with Putnam's argument is that, as any good dispositionalist will admit, dispositions only manifest ceteris paribus -- that is, under normal conditions, absent countervailing forces. (This has been especially clear since Nancy Cartwright's influential 1983 book on the centrality of ceteris paribus conditions to scientific generalizations, but Ryle knew it too.) Putnam quickly mentions "a behavioural statement with a 'normally' or 'probably' in it", but he does not give the matter sufficient attention. Super-super-spartans' intense desire not to reveal pain is a countervailing force, a defeater of the normality condition, like the technological efforts of the scientists of PureWater. To use hypothetical super-super-spartans against a dispositional approach to pain is like saying that water-solubility isn't a dispositional property because there's a possible planet where soluble objects reliably fail to dissolve when immersed in water. Most generalizations admit of exceptions. Nerds wear glasses. Dogs have four legs. Extraverts like parties. Dropped objects accelerate at 9.8 m/sec^2. Predators eat prey. Dispositional generalizations are no different. This does not hinder their use in defining mental states, even if we imagine exceptional cases where the property is present but something dependably interferes with its manifesting in the standard way. Of course, if some of the relevant dispositions are dispositions to have certain types of related conscious experiences (e.g., inner speech) and to transition to related mental states (e.g., in jumping to related conclusions), as both Ryle and I think, then the super-spartan objection is even less apt, because super-super-spartans do, by hypothesis, have those dispositions. They manifest such internal dispositions when appropriate, and if they fail to manifest their pain in outward behavior that's because manifestation is prevented by an opposing force. In most respects, the universe (which some call the Library) is everywhere the same, and we at the summit are like the rest of you below. Like you, we dwell in a string of hexagonal library chambers connected by hallways that run infinitely east and west. Like you, we revere the indecipherable books that fill each chamber wall, ceiling to floor. Like you, we wander the connecting hallways, gathering fruits and lettuces from the north wall, then cast our rinds and waste down the consuming vine holes. Also like you, we sometimes turn our backs to the vines and gaze south through the indestructible glass toward sun and void, considering the nature of the world. Our finite lives, guided by our finite imaginations, repeat infinitely east, west, and down. But unlike you, we at the summit can watch the rabbits. The rabbits! Without knowing the rabbits, how could one hope to understand the world? The rabbit had entered my family's chamber casually, on a crooked, sniffing path. We stood back, stopping mid-sentence to stare, as it hopped to a bookcase. My brother ran to inform the nearest chambers, then swiftly returned. Word spread, and soon most of the several hundred people who lived within a hundred chambers of us had come to witness the visitation -- Master Gardener Ferdinand in his long green gown, Divine Chanter Guinart with his quirky smile. Why hadn't our neighbors above warned us that a rabbit was coming? Had they wished to watch the rabbit, and lift it, and stroke its fur, in selfish solitude? The rabbit grabbed the lowest bookshelf with its pink fingers and pulled itself up one shelf at a time to the fifth or sixth level; then it scooted sideways, sniffing along the chosen shelf, fingers gripping the shelf-rim, hind feet down upon the shelf below. Finding the book it sought, it hooked one finger under the book's spine and let it fall. The rabbit jumped lightly down, then nudged the book across the floor with its nose until it reached the reading chair in the middle of the room. It was of course taboo for anyone to touch the reading chair or the small round reading table, except under the guidance of a chanter. Chanter Guinart pressed his palms together and began a quiet song -- the same incomprehensible chant he had taught us all as children, a phonetic interpretation of the symbols in our sacred books. The rabbit lifted the book with its fingers to the seat of the chair, then paused to release some waste gas that smelled of fruit and lettuce. It hopped up onto the chair, lifted the book from chair to reading table, and hopped onto the table. Its off-white fur brightened as it crossed into the eternal sunbeam that angled through the small southern window. Beneath the chant, I heard the barefoot sound of people clustering behind me, their breath and quick whispers. The rabbit centered the book in the sunbeam. It opened the book and ran its nose sequentially along the pages. When it reached maybe the 80th page, it erased one letter with the pink side of its tongue, and then with the black side of its tongue it wrote a new letter in its place. Its task evidently completed, the rabbit nosed the book off the table, letting it fall roughly to the floor. The rabbit leaped down to chair then floor, then smoothed and licked and patiently cleaned the book with tongue and fingers and fur. Neighbors continued to gather, clogging room and doorways and both halls. When the book-grooming was complete, the rabbit raised the book one shelf at a time with nose and fingers, returning it to its proper spot. It leaped down again and hopped toward the east door. People stepped aside to give it a clear path. The rabbit exited our chamber and began to eat lettuces in the hall. With firm voice, my father broke the general hush: "Children, you may gently pet the rabbit. One child at a time." He looked at me, but I no longer considered myself a child. I waited for the neighbor children to have their fill of touching. We lived about a hundred thousand levels from the summit, but even so impossibly near the top of our infinite world, one might reach old age only ever having seen a couple of dozen visitations. By the time the last child left, the rabbit had long since finished eating. The rabbit hopped toward where I sat, about twenty paces down the hall, near the spiral glass stairs. I intercepted it, lifting it up and gazing into its eyes. It gazed silently back, revealing no secrets. What's the Likelihood That Your Mind Is Constituted by a Rabbit Reading and Writing on Long Strips of Turing Tape? Your first guess is probably not very likely. (1) A computationalist-functionalist philosophy of mind is correct. That is, mentality is just a matter of transitioning between computationally definable states in response to environmental inputs, in a way that hypothetically could be implemented by a computer. (2) As Alan Turing famously showed, it's possible to implement any finitely computable function on a strip of tape containing alphanumeric characters, given a read-write head that implements simple rules for writing and erasing characters and moving itself back and forth along the tape. (4) The universe is infinite. I explore this possibility in "THE TURING MACHINES OF BABEL", a story in this month's issue of Apex Magazine. I'll link to the story once it's available online, but also consider supporting Apex by purchasing the issue now. The conclusion is of course "crazy" in my technical sense of the term: It's highly contrary to common sense and we aren't epistemically compelled to believe it. Among the ways out: You could reject the computational-functional theory of mind, or you could reject the infinitude of the universe (though these are both fairly common positions in philosophy and cosmology these days). Or you could reject my hypothesized rabbit implementation (maybe slowness is a problem even with perfect computational similarity). Or you could hold a view which allows a low ratio of Turing rabbits to normal minds despite the infinitude of both. Or you could insist that we (?) normally implemented minds have some epistemic access to our normality even if Turing-rabbit minds are perfectly similar and no less abundant. But none of those moves is entirely cost-free, philosophically. Notice that this argument, though skeptical in a way, does not include any prima facie highly unlikely claims among its premises (such as that aliens envatted your brain last night or that there is a demon bent upon deceiving you). The premises are contentious, and there are various ways to resist my combination of them to draw the conclusion, but I hope that each element and move, considered individually, is broadly plausible on a fairly standard 21st-century academic worldview. The basic idea is this: If minds can be implemented in strange ways, and if the universe is infinite, then there will be infinitely many strangely implemented minds alongside infinitely many "normally" implemented minds; and given standard rules for comparing infinities, it seems likely that these infinities will be of the same cardinality. In an infinite universe that contains infinitely many strangely implemented minds, it's unclear how you could know you are not among the strange ones.